See in general T. S. MacKay, “More Byzantine and Frankish Pottery from Corinth,“ Hesperia 36.3 (1967), pp. 254-255, nos. 11-13, fig. 1, pl. 62; C. Williams and O. H. Zervos, “Frankish Corinth: 1991,“ Hesperia 61.2 (1992), pp. 151-154, fig. 7. 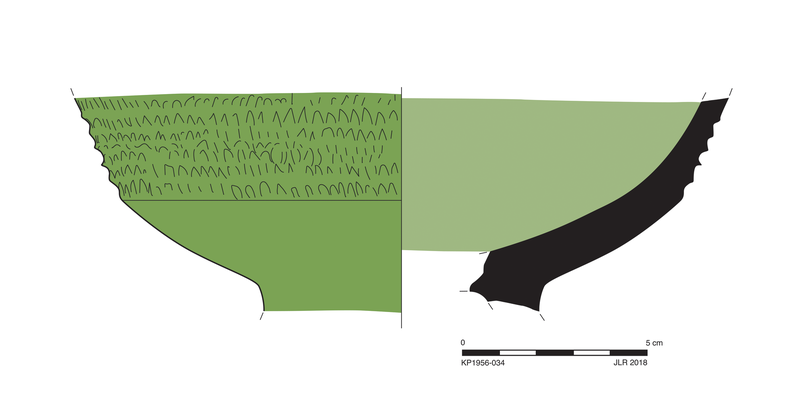 Deep carinated bowl. Slightly splayed ring foot has concave outer face. Wall slightly convex below carination and flaring straight above. Six overlapping rows of chattering (“rouletting“) on upper exterior. Ca. late 13th-early 14th century. 2.5YR 6/8 (reddish orange). Fabric is somewhat hard, medium fine, with few, small, subrounded to subangular, inclusions (sandy?). Thin, even, white slip. 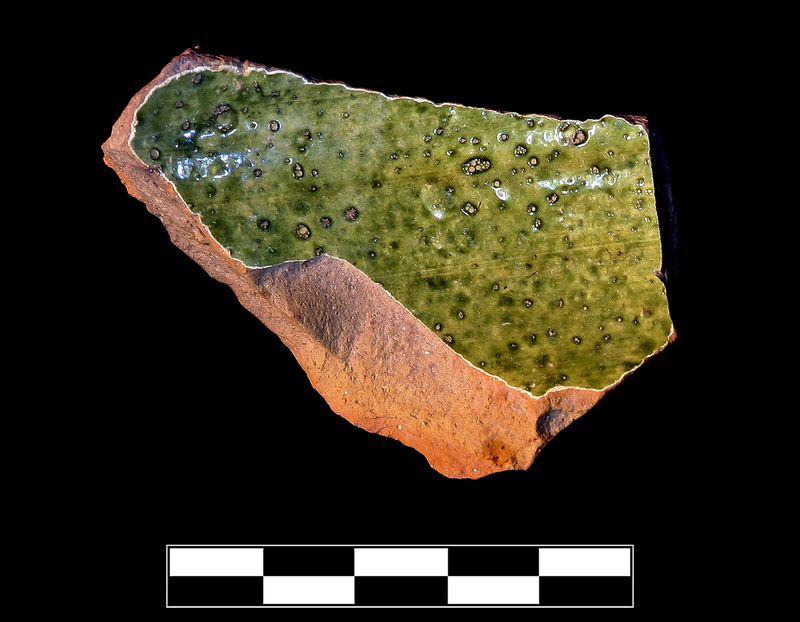 Somewhat thick, most even, mottled, bright green glaze fired hot to create craquelure and numerous clustered bubbles on all surfaces. 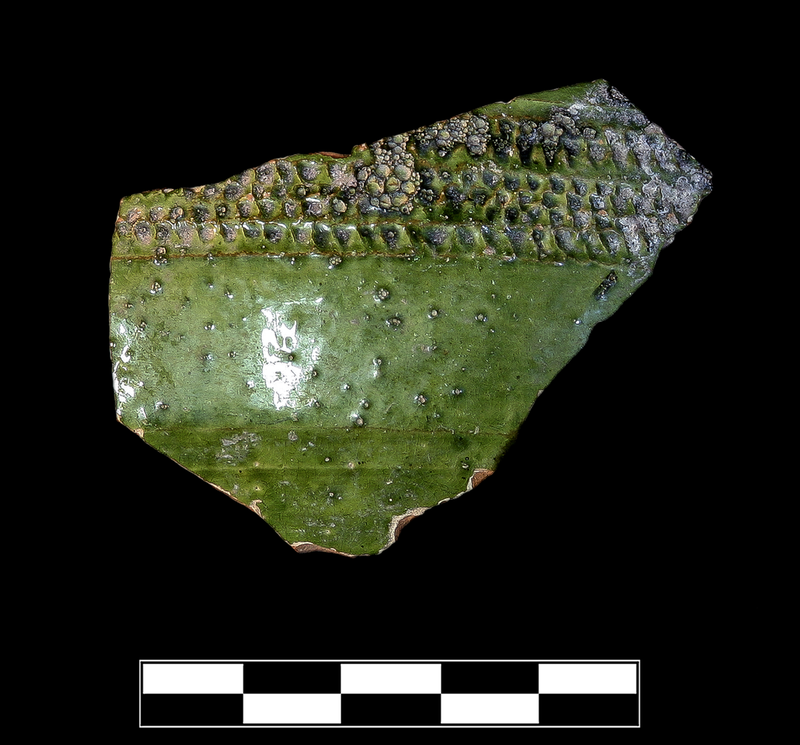 One sherd preserves small part of upper body. Slight, sparse chipping around edges; specks of encrustation; incipient vitreous erosion.